Overview: If you think you have what it takes to rule a high school filled with creeps, then spin into the plot of this classic horror story for a chance at victory. The thrilling sequel to Zombies vs Cheerleaders will infect you with blood-splattered action as you annihilate zombies to save the girls and claim your prize. Based on the hit comic book anthology of the same name, this is the video slot where only the brave will thrive. 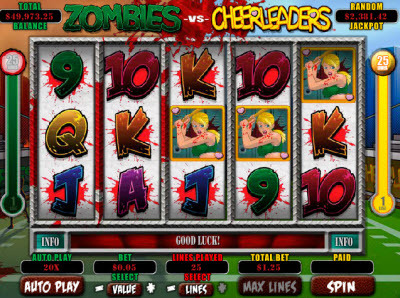 Similar Slots: If you like Zombies vs. 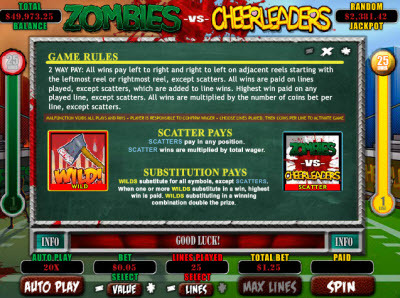 Cheerleaders II, you might like these other BetSoft Gaming slots: 2 Million BC, Enchanted, Rook's Revenge, The Glam Life.